Tweetbot for iOS has undergone another big upgrade today. The new release marks the first time the iPad version of the app has been redesigned to match the all-new UI introduced in iOS 7. iPhone users need not feel left out, however, as this update has a set of new features and design tweaks for you as well. Let’s dive right in and take a look at what’s new. The new features in Tweetbot 4 appear across both iPhone and iPad, bringing the two apps in line for the first time in a while. This is aided by the iPad’s new design, which we’ll discuss later. The biggest new feature you’ll find in Tweetbot 4 is the all-new “Activity” tab. For a long time users have been confined to Twitter’s first-party app if they wanted a feed of their incoming favorites, retweets, and follows alongside their mentions. Twitter doesn’t provide an API to allow third-party developers to include this type of feed, but the Tapbots team has worked around that restriction to create a recent activity view that’s even better than Twitter’s own. The Activity tab is broken up into two different views: Stats and Activity. Stats is the primary view you’ll see when you first open the tab and it is a beast. Want to know how many favorites or retweets you got today? This tab can tell you. Want to know how many new followers? It can do that, too. Want to see all of that activity plotted on a weekly graph to show you how your interactions rose and fell over the past seven days? It even does that. It also breaks down all of your retweets and favorites tweet-by-tweet and shows you on a progress bar how popular each tweet is compared to each tweet using individual scales for each metric. That means if your tweets usually get more favorites than retweets, it will take more favorites to fill that progress bar on each tweet, while you’ll be able to fill the retweets bar more easily. Oh, and all of this updates live, no refreshing required. Tapping a tweet on this view takes you to a new type of tweet detail view. This view is only accessible through the Stats page, so it’s not replacing the regular tweet details view throughout the whole app. The big difference in this view is that while it doesn’t present all of the same information as the regular tweet detail view (like the exact time something was posted) it does give you an easy way to find all replies to (or new-style quotes of) that tweet. We haven’t even touched on the second part of this tab, the Activity view, yet. This view is more what you’re used to seeing in Twitter for iPhone. It’s simply a chronological list of every incoming mention, quote, favorite, retweet, or follow you’ve received. 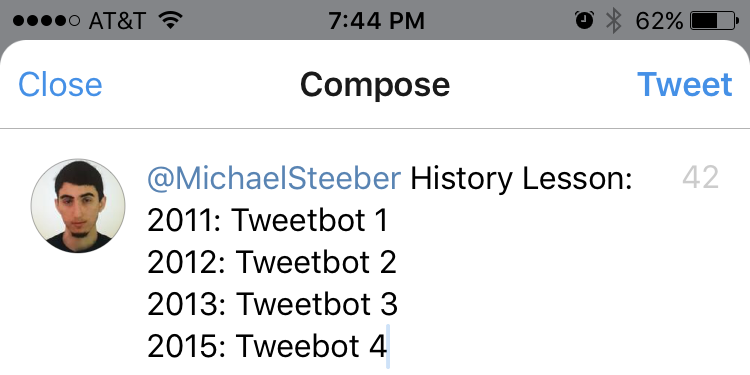 Speaking of quotes Tweetbot now includes Twitter’s new-fangled quotes in the Mentions tab. Where you previously had the option of getting notifications for incoming quotes, but no way to see them in one place in the app, you’ll now be able to see them right alongside your other replies, which should help keep conversations intact. Another new addition to keep conversations going is support for iOS 9’s quick reply function. With the latest version of Apple’s mobile operating system, third-party apps can take advantage of Messages-style quick reply right from the notification banner, and Tweetbot 4 includes this capability, meaning you may never have to open the app to reply to another message. When you do open the app to reply or compose a new tweet, you’ll spot a number of design tweaks. The compose view has been mostly overhauled, and though there’s not a whole lot of functionality that was missing in earlier versions, it has gained a new photo picker similar to the one in the Messages app that makes quickly selecting recent images a much quicker process. One change on this screen that users will need to get used to (and that I still haven’t gotten used to) is the repositioned options when cancelling a tweet. Previously you’d be presented with a sheet sliding up from the bottom of the screen asking whether you want to discard or save the tweet as a draft. Now those buttons pop right out of the cancel button, putting them at the top of the screen instead. If you’ve trained your muscle memory to reach for the bottom of the screen when cancelling, you’ll have to spend some time retraining for this change. While most of the other design changes are purely cosmetic (larger cells and a white background in the settings section, for example), there is one other place where you may need some time to adjust: the tweet detail view. When you swipe right on a tweet in the timeline (or most other places), you’ll see a mostly-familiar version of the detail view, but with a significant change: the position of replies and earlier tweets in a threaded conversation have been switched to match Twitter for iPhone. In Tweetbot 3 and every version prior to that, replies to a tweet appeared at the top of the screen and older tweets in a conversation appeared at the bottom. Now an “in reply to…” divider above the tweet leads you to the conversation, while new replies appear below it. These replies are also in reverse order, putting the oldest ones at the bottom and the newest ones at the top. While this is backwards from how you might expect if you’ve used Twitter on the web or an official client, it actually makes sense. You’ll often want to check a tweet for new replies, but once you’ve seen the old replies, you likely don’t need to review them as often. Putting newer replies closer to the original tweet allows you to reach them more quickly. Finally, one of the promised features of Tweetbot 4 was a redesigned profile view, and this update does not disappoint in that regard. The Tweetbot 3 profile gave you quick access to a user’s recent photos, but you needed to tap through to see any of their recent tweets. In Tweetbot 4, recent tweets are placed right on the main profile page. The layout is similar to that of the Mac app, with the profile photo, bio, location, cover image, settings button, follow button, and URL all in exactly the same positions for cross-platform consistency. The counters for followers and following have been made smaller and placed directly under the other profile info. The recent tweets listed on the front page of the profile don’t include replies and mentions, so you’ll have a good idea from this screen what type of tweets you’ll see in your timeline if you choose to follow someone. If you want to see who they talk to and what they talk about, you can tap through to their full timeline using the “Tweets” button at the top of the list (in basically the same position as Tweetbot 3). The new profile view also adds a section that helps you decide whether you may want to follow someone by highlighting friends you might have in common. It does this by comparing the list of people you follow to the list of people following any given account and then listing the common users. For example, if you follow six people who all follow @9to5Mac, you’ll see those six people listed on the 9to5Mac profile page. As complete as this overview seems, there are still plenty of other little design tweaks throughout the app. There’s a new icon that fits in better with the latest iOS apps, a + button and an iPad-style popover to compose new direct messages, and support for iOS 9’s Safari View Controller browser. A new GIF/video viewer hides the controls and lets you pause playback with a tap. Bugs have been fixed left and right. Nearly every corner of Tweetbot 4 feels like a new app. Larger devices (4.7″ and up) also include support for landscape usage. The iPhone Plus models will gain a two-up layout in this view. While the iPad version functions in essentially the same way as the iPhone version, the design has been completely overhauled. iPad users will finally be able to take advantage of the new iOS 7 design that, up until now, had yet to reach the larger screen. Tweeters using the latest iPad hardware will also benefit from the inclusion of new multitasking modes. 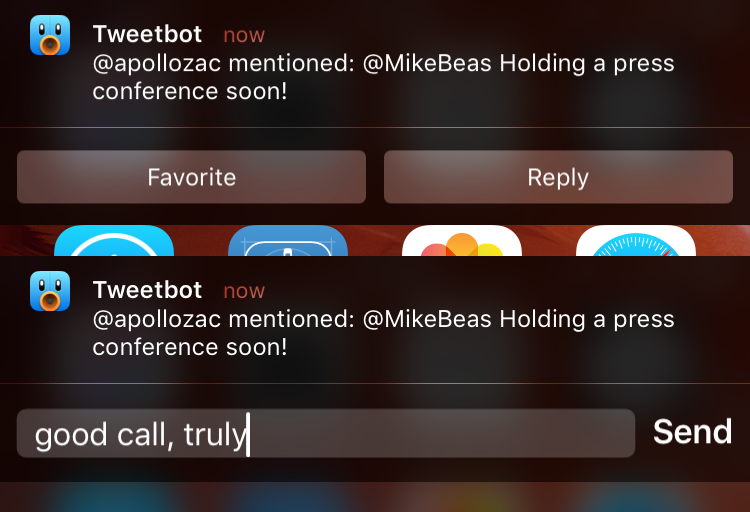 Tweetbot 4 has complete support for SlideOver and side-by-side multitasking. We’ve created a gallery below showing off the iPad app’s redesigned UI. Tweetbot 4 is available right now on the App Store for a special launch price of $4.99. It’s a new universal app that runs on both iPhone and iPad. Once the introductory special has ended, the price will jump to $9.99. Interestingly, Tapbots has cleverly found a way to leverage the App Store’s app bundle feature to provide upgrade pricing to customers who bought Tweetbot 3.